One of my Chief Culinary Consultant’s best friends has an unbelievable knack for throwing delicious summer parties. I walk away from every one of his get-togethers with a recipe I have to make. These parties have brought you the Beer and Brown Sugar Kielbasa & Sauerkraut, they’ve introduced me to the phenomenal Harry & David relishes and last year, I was reminded that I really needed to dig out my Aunt Dorothy’s recipe for Chinese Coleslaw. Before last year’s 4th of July cookout, I couldn’t remember the last time I had this coleslaw, but it was one of the side dishes that day and I (unapologetically) had several servings. 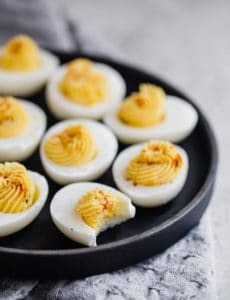 It’s one of the easiest recipes you’ll ever make, it feeds an army and people always rave about it, which makes it absolutely perfect for bringing to parties and get-togethers when you’re not sure what to make. Growing up, my Great Aunt Dorothy was the keeper of the Fourth of July holiday – she had a cookout each and every year for extended family. While I don’t remember much about food from that long ago, I firmly associate two dishes with her and that picnic – this coleslaw and Strawberry Pretzel Salad. It’s probably no coincidence that I have little problem polishing off either one all by myself! 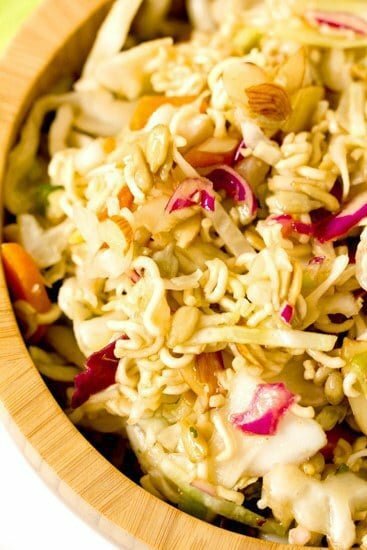 This recipe is a combination of coleslaw, almonds, sunflower seeds, green onions and crushed Ramen noodles, tossed together with a sweetly seasoned dressing. It’s very light, and as a result, a perfect addition to summer menus. I hope there’s another summer party in the works so I can discover more great recipes! What are some of your favorite eats for cookout/picnic season? 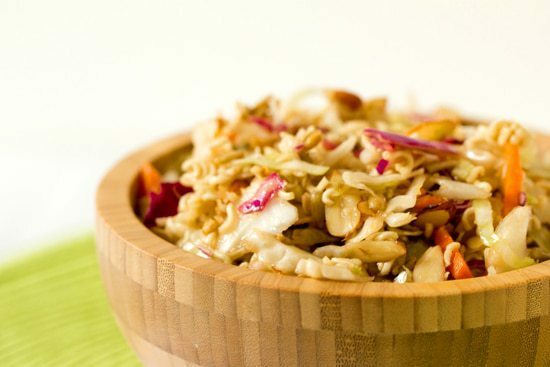 In a large bowl, mix together the coleslaw mix, sunflower seeds, almonds, green onions and crushed Ramen noodles. In a small bowl, whisk together the oil, sugar, vinegar and seasoning packets until well blended. 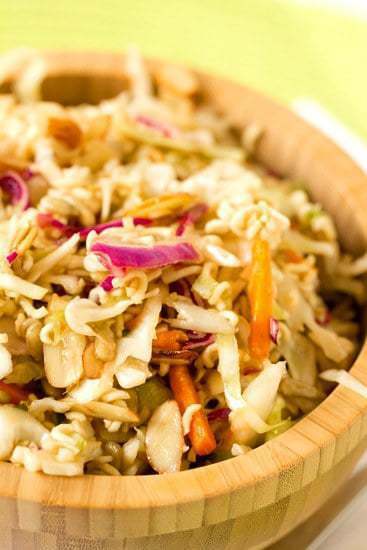 Pour the dressing over the coleslaw mixture and toss until it is evenly distributed. Refrigerate until ready to serve. Simple and satisfying. My mom has made a version of this for years. I add whatever crunchy thing or fruit (orange segments, shredded apple) I have around that fits. Try toasting those crushed ramen noodles in the oven, drizzled with a touch of sesame oil! I had this at a pot luck dinner and just loved it! I found your recipe online and it is perfect!! We do not eat onions so I omitted them. Yum-yum!! This is a keeper and easy to make!! So I happen to have rice vinegar? Do you think that would be good instead of white wine vinegar? Hi Rentzi, This actually calls for regular white (distilled) vinegar, not white wine vinegar. I have never tried it with rice wine vinegar, I think it would impart a milder flavor. This salad is always a hit at get-togethers. Thanks for sharing!! 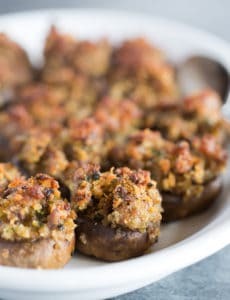 I just happened across this recipe and it popped out at me. The only time I had this was when my Mom was visiting for the birth of my 4th child. She made it for us and I only saw her once after that before she died at the age of 51. I was only 34, and I always try to URGE other women to visit your Mom and go Christmas shopping with her and call her NOW. You just never know when it will be too late. Thanks for the memory. Rather than frying we toast them in the oven on broil. Same with sunflower seeds and almonds. I am asked to make it for family gatherings. Love this classic recipe! I usually toast the sunflower seeds, sliced almonds and crushed noodles in a fry pan on the stove before adding to the salad…try it! I also sometimes add a little soy sauce and peanut butter to the dressing…especially yummy with shredded chicken and even a squeeze of fresh orange or a thin slice for garnish…summer is coming and this recipe is on the menu!!! hey this is looks amazing i never try it but i wanna do it .. so can u tell me if the noodles suppose to be crunchy ??? or soft ??? The noodles should be crunchy. Enjoy! Add a few tbsp of soy for an added kick. Great recipe. I just made this for tonight’s roofdeck bbq. Left out the nuts due to food allergies and added more sunflower seeds for crunch. This is outstanding!!!! Perfect alternative to mayo based side dishes. Like the suggestion with the chopped up leftover grilled chicken. I will be making this again! Made the coleslaw this weekend. I highly recommend this recipe. Its a keeper. My family loved everything about it. As one of the reviewers suggested, I chopped up grilled chicken in the leftover slaw as a meal the next day. It was even better. Funny, last night I went out for a family dinner to a local hole in the wall that my dad loves and this was actually on their menu. You could order it as a main dish salad with or without added chicken (my dad and brother both did) or as a side item with your sandwich (dad’s wife). Hi Boomer, Thanks for the adaptation suggestions, I’m going to give those a try! This recipe looks great, but what are Ramen noodles, are they already cooked?What does a coleslaw mix have in it – onions, cabbage, carrot??? Please give details for those of us who do not live in convenience heaven! Hi Scilla, Ramen noodles are sold in square packages – they are dried Asian-style dried noodles that usually come with a seasoning packet. You’ll find them in any grocery store. A coleslaw mix usually has purple and green cabbage, along with shredded carrots. My mom makes something almost just like this and I have always loved it! But when she gave me her recipe, I about choked when I started adding up the calories! So I made my own version with way fewer calories. Now I can have this tasty side without all the guilt. I love it!